Are you Living Pain Free? begins at Weimer Chiropractic. Text or call today. with structural and neurological chiropractic care. text or call to make an appointment. At Weimer Chiropractic, we do much more than treat backaches and provide sports physicals. We provide a full range of structural and neurological chiropractic care. rated 5 Stars on most rating websites. Discover what our patients say about Weimer Chiropractic and their experience with accident and pain recovery. Some fascinating facts about your health are included. Our money saving offer is for patients new to Weimer Chiropractic. We keep your initial exam and first treatment costs low to speed your path to recovery. 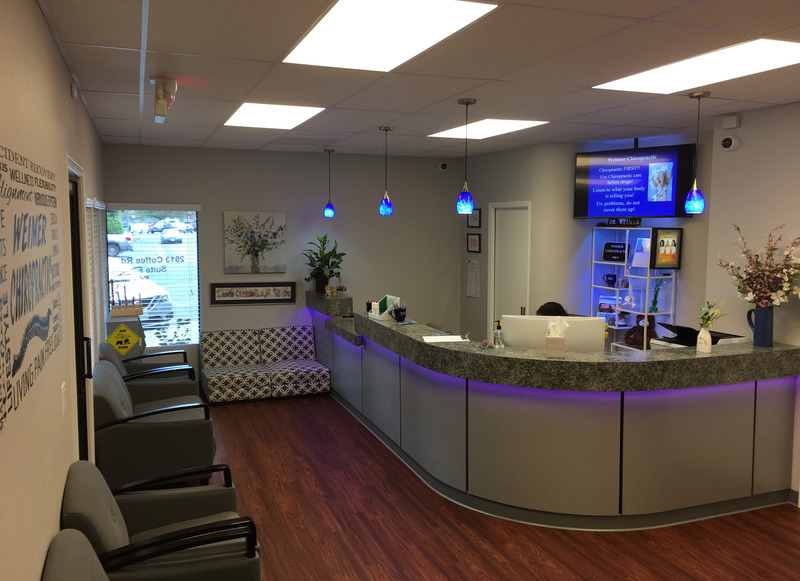 Located at 2813 Coffee Road, Building F, in a new state-of-the-art office with full high definition X-ray, we are dedicated to helping you achieve your accident recovery and health restoration objectives. 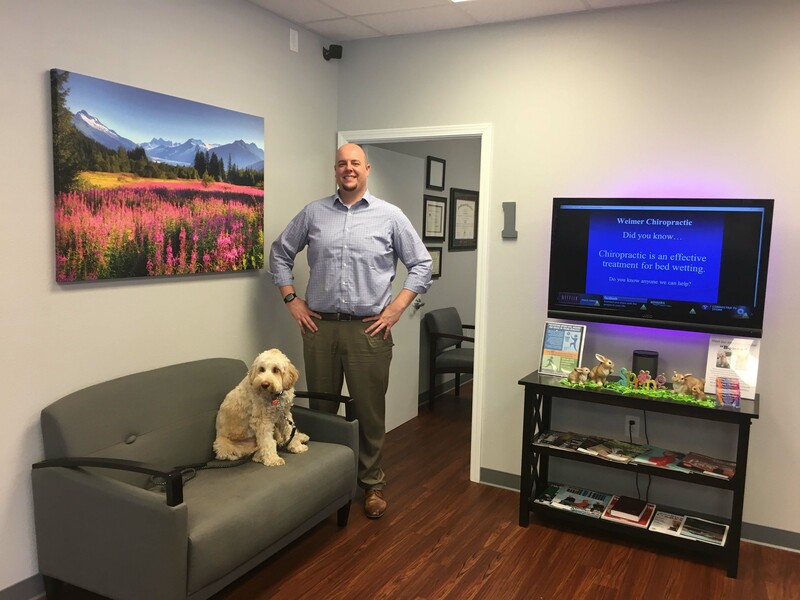 As a licensed chiropractor with advanced training and experience in functional chiropractic neurology, Dr. Weimer's mission is to provide the highest quality care that spans the full spectrum of structural and pain neurology chiropractic. We provide head to toe adjustments, spinal correction, and brain stimulation utilizing state-of-the-art techniques and equipment. We are committed to bringing you better health and quality of life. Many of the advanced services we provide are not available in most medical doctor's and chiropractor's offices. Proper diagnosis, high standards of care and time efficiency are top priorities at Weimer Chiropractic. 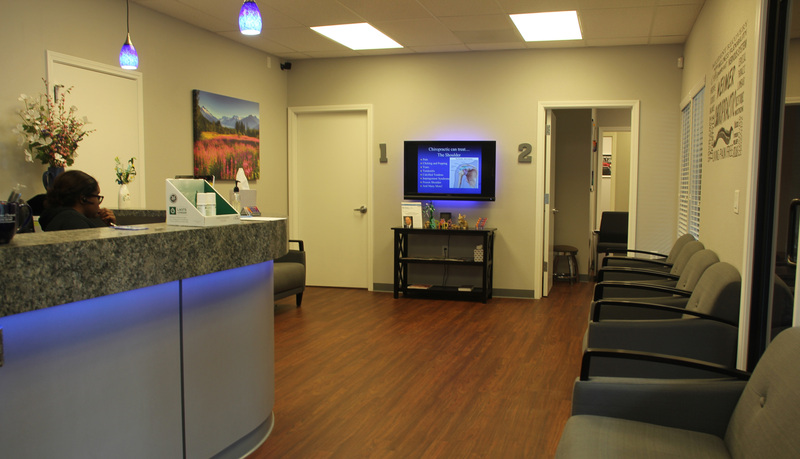 Dr, Weimer founded Weimer Chiropractic in 2008 in a small office on Carpenter Road. He has a reputation for providing high quality low to medium impact adjustments. His journey in developing Weimer Chiropractic Prof. Corp. has been described by many as steady growth occasionally interrupted by trials by fire. These challenges were difficult at the time but has made him, his staff and his organization more effective. We are encouraged by our patients and friends who often vote us Best Chiropractor in Modesto. Dr. Weimer is rated 5 Star on Google, Facebook, and BizVotes. Discover what our patients say about Weimer Chiropractic and their experience with accident and pain recovery. Dr. Weimer was voted #1 on BizVotes Modesto for the years: 2019 through 2009, or the last eleven consecutive years. 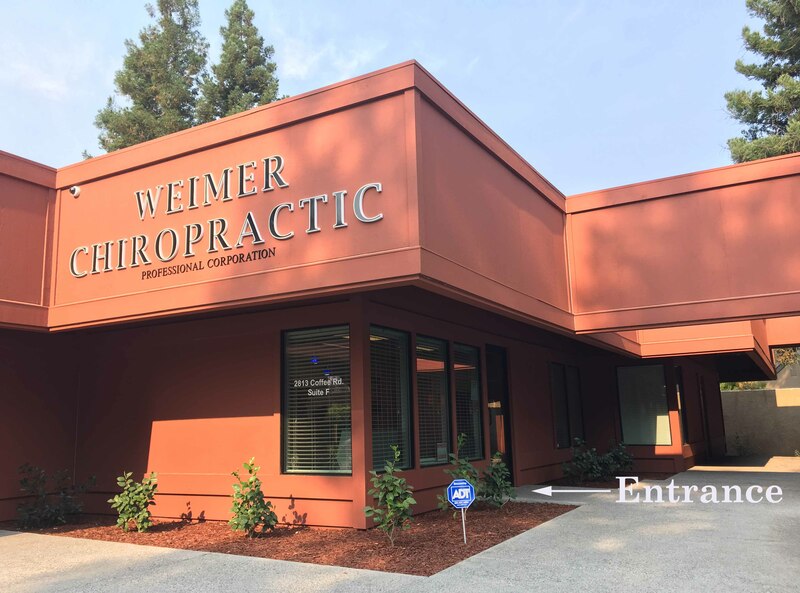 Dr. Weimer was honored by the website The Three Best, Modesto in 2016 with the Introduction, "Probably the best chiropractor in Modesto." This award by The Three Best has been repeated in 2017, 2018, and 2019. See other honors on the our awards page and other pages of this website. Above are Dr. Weimer and Bones, our office dog. Bone's job title is Chief Barketing Officer. Patients seeking treatment with Dr. Timothy J. Weimer are assured of receiving only the finest quality care that begins with one of the most complete exams in the central valley. Dr. Weimer, as Modesto's only doctor to complete four year post-doctoral neurology program to become a Board Eligible Diplomate, has helped thousands of patients recover fully from an auto accident, and joint pain of the body, including foot pain, knee pain, shoulder pain, elbow pain, wrist pain, carpal tunnel, leg pain, back pain, whiplash pain and neck pain. Dr. Weimer completed his post doctoral program in Chiropractic Neurology from the Carrick Institute. This training, study and clinical experience has magnified his ability to diagnose and correct brain-based and spine related chronic back pain, balance disorders, ADHD, autism and other disorders. Because of this advanced training, Dr. Weimer's exams and techniques provide greater benefits to his patients. For more details on chiropractic neurology and brain based therapy click here to go directly to the Services and Treatments section. 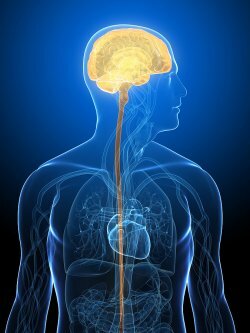 Chiropractic neurology is a three year plus post-doctoral program on the human body's neurons, nervous system as it functions to interpret pain and respond to pain management / relief and brain based therapy. If we may serve you, give us a call, text or use the request an appointment on this website to make an appointment. Most health insurance plans including Medicare are increasing coverage for chiropractic. To mention a few health insurance companies, we work with everyday, Health Comp, Aetna, Anthem Blue Cross, Health Smart, Multi Plan, Kaiser, Medicare, PacifiCare and others. We cannot list them all. Call my office to confirm your current health insurance coverage or ask about our cash plans. If you are interested in starting your journey towards greater health and wellness, please subscribe to our award-winning newsletter. We like to keep you current in developments in the chiropractic and wellness field. Feel free to email Dr. Weimer with any questions you may have using the link at the bottom of every page. Send articles of interest to your friends or request an appointment online. Be sure to recommend Weimer Chiropractic to your friends who were in an auto accident or who live with backache, joint pain, infirmity, or just want better performance and wellness. Stay active and promote a healthy lifestyle for yourself, your family and your friends, Living pain free begins at Weimer Chiropactic. A chiropractic neurologist is a chiropractor who has completed a four year post-doctoral program on the nervous system as it relates to treating chronic back pain, balance problems, joint pain and other brain based and/or spinal issues. A chiropractic neurologist is a highly trained professional who considers physical trauma, stress, posture and medical history to develop effective treatment plans. Dr. Tim Weimer is Board Eligible in the Chiropractic Neurology program from the Carrick Institute. Dr. Weimer evaluates a patients nervous system such as vision, hearing and standing to improve the mobility of joints and muscles..He is the only chiropractor in Modesto to be named board eligible in Chiropractic Neurology by the Carrick Institute. Dr. Ted Carrick DC, who directs the Institute has received much media attention for his treatments on Sidney Crosby, NHL superstar. Sidney Crosby was injured by a major head concussion a number of years ago. His recovery has been slow but progressing. Since Dr. Ted Carrick D.C played a major role in providing his care, Sidney Crosby recovered through most of 2015. In 2016 and 2017 he resumed playing professional hockey, helping the Penguins win the Stanley Cup. Dr. Timothy J. Weimer D.C.
"Simply the best Chiropractor in town and possibly in the area, Dr. Weimer is very good at what he does. He is courteous, professional, and takes the time to learn abut your injuries." Quotation taken from The Three Best Rated, Chiropractor, Modesto.2015. Fascinating Facts about your Health and Chiropractic. The Magna Report said chiropractors provide the most effective and cost effective treatments of low back pain. Back pain occurs when nerves, muscles joints and discs have lost their normal functioning. Drug addiction often begins with prescribed Opioids intended to treat pain. Prescription Opioid Addiction has reached crisis proportions in the city of Modesto and the state of California. Headaches are the #1 reason consumers use over the counter drugs. Headaches are a major cause of suffering and missed work and rank as one of the most common reasons people consult a doctor. Chiropractic neurologists have considerable success relieving the cause of pain. If you are suffering from headaches and/or chronic pain you owe it to yourself and your family to have them evaluated for their cause. 35 million Americans visited a chiropractor last year for drug free pain management. Chiropractic is a much safer strategy for pain relief than pain pills, injections, or surgery. if your would like to sign up for our award-winning newsletter, go to the Featured Articles / Newsletter section at the bottom of this page.